You’ll love this classic New England, Par 54 golf course nestled among the hollies and pines of Sandwich. The course, with eighteen unique holes over 3000 yards, challenges the more advanced player and relaxes the new golfer. Play more golf in less time! Falmouth Country Club is a challenging 27-hole, year-round public golf course not far from the Atlantic beaches, cranberry bogs, and all that is Cape Cod. Open year round. 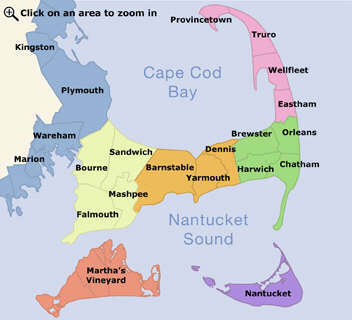 Miacomet is Nantucket's only 18-hole public golf facility and is owned by the Nantucket Islands Land Bank. The beach grasses and rolling fairways provide a naturally beautiful setting for this challenging but very playable links-style course. Putting green, driving range, restaurant, and "snack shack" available. Since opening in 1998, The Championship Course at Waverly Oaks Golf Club in Plymouth has become one of New England’s best public courses. Four sets of tees, wide forgiving fairways and large undulating greens provide a true test for golfers of all abilities. Elevation changes and finely manicured conditions provide an aesthetic appetizer for any... show more Since opening in 1998, The Championship Course at Waverly Oaks Golf Club in Plymouth has become one of New England’s best public courses. Four sets of tees, wide forgiving fairways and large undulating greens provide a true test for golfers of all abilities. Elevation changes and finely manicured conditions provide an aesthetic appetizer for any golfer’s palette. Our goal is to create an environment that is unparalleled. As an upscale daily fee facility, we are committed to friendly and superb customer service. We invite you to treat yourself and your guests to an exceptional experience with us for an excellent value.